The Peninsula Township Parks Committee is composed of (7) members that are appointed by the Township Board. Their names and positions are listed below. Each member can be reached by email. The Parks Committee has the responsibility for the development and operation of all the township parks and works with the Township Building and Grounds staff to maintain the parks for the benefit of all park users. If your concerns are urgent or involve an issue of public safety your emailed or written comments will receive a prompt response from a parks committee member. General questions and concerns are addressed at the Parks Committee monthly meetings and you can expect both a timely consideration and response. Parks Committee meetings are held on the second Wednesday of each month at the township office and are open to the public. Parks Committee meeting dates and previous meeting agendas and minutes are available on the township website. Click HERE to view the Park Commission activities and accomplishments. Click here for the Adopt-A-Park General information and Outline. Click here for the Adopt-A-Park Application. Donation of Memorial Park Benches - Click HERE for more information. Pelizzari Natural Area Map it! An enormous amount of work has taken place at Pelizzari Natural Area since Peninsula Township formally took ownership in July of 2009. Please keep your dog on a leash while in the Pelizzari Natural Area. ​2018 Peninsula Township Recreation Plan and Pelizzari Natural Area Management Plan. Bowers Harbor Park Map It! This facility is the major park for recreation programming. See below for Pavilion Reservations. Tennis and Volleyball courts. Click HERE for tennis lesson details. Peninsula Township, with the assistance of grant funds from the Michigan Natural Resources Trust Fund, the Grand Traverse Regional Land Conservancy, and significant private donations, recently acquired 60 acres of land adjacent to the current Bowers Harbor Park. This expansion of the existing park will enhance an already popular recreation destination in Peninsula Township to include additional non-motorized trails for access to natural and recreational resources. From May of 2016 to March of 2017, a committee carried out an extensive planning and public input process that resulted in a conceptual plan for a cohesive recreation area composed of the original Bowers Harbor Park and the expansion area. The Peninsula Township Park Commission approved the recommended Final Proposed Concept Plan at their June 2017 meeting as a guide for future development, but public comment and input continues to be welcome. Click HERE to View the BHP Final Proposed Concept Plan. Susie Shipman, who chaired the planning committee, at shipman.parks@gmail.com. Please note: There is now a mowed one mile long temporary trail in the park expansion area - please be aware of poison ivy observed alongside the trail in some locations. Haserot Park & Boat Launch Map it! Archie Roadside Park Map it! Archie Park is a roadside park on M-37, near Gray and Bluff Roads. There are no Department of Transportation roadside parks, and the Township Park is used by a variety of people. The Department of Transportation employees use the area for temporary storage of equipment and as a place for eating lunch. Bicyclists use the park as a parking lot and staging area for tours of Old Mission Peninsula. As traffic increases, additional use is anticipated for this small park. It is also the only public access to east Bay south of Old Mission except for the DNR Launch Site at East Shore Road and M-37. Because of its location at the end of the Peninsula and the end of M-37, and the historic site for the Lighthouse, this park is receiving an annual increase in users. It is commonly utilized as a year round facility. Cross-Country ski, biking, and hiking/walking trails. Click here for a trail map. Old Mission Point Park Map it! 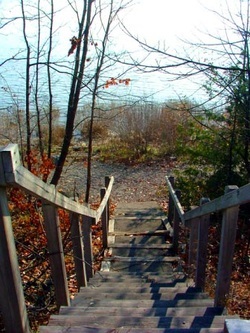 Adjacent (south) to the Lighthouse Park, this land was acquired by lease with the help of the Department of Natural Resources and the Michigan Natural Resources Trust Fund. Cultural Center/Historic Church Map it! This small historical site has recently been discovered by the public since the Park Board installed historic documents and improved the historic story of the area. On site parking is available and the church is open daily. The pavilions at Bowers Harbor park can be reserved for a fee June through September. Please contact the Susan Piehl (231) 223-7322 ext. 1 (email: officemanager@peninsulatownship.com) for availability, then use the link below to complete the request for reservation and submit it with the appropriate fee. No reservations will be made until the fee and application have been received. NOTE: If the approximate number of people at your event is more than 50 people, you will be required to get a Special Events Permit approved by the Parks Committee. Please see Special Events Application below. Click to view/print a Special Events Permit Application. Businesses and Non-Profits with a group larger than 50 people must also submit a Certificate of Liability Insurance naming "Peninsula Township" and "Peninsula Township Parks Committee" as additional insured in the amount of at least one million dollars prior to your event. Pavilion #1 - 40'x18', 8 picnic tables (1 is handicap accessible),3 grills, $60.00. Pavilion #2 - 25'x18', 4 picnic tables, 2 grills, $30.00. Pavilion #3 - 25'x18', 4 picnic tables (1 is handicap accessible), 2 grills $30.00.